I was upset to hear about the death of Ricky (your imaginary boyfriend). However, now that you have new single status, could we pretend that I am your imaginary stalker? I am going to pretend that what you sent me was an imaginary letter. I want to be a fireman someday. I already have a fireman’s uniform. Also, I’ve been practicing with a garden hose. But my parents don’t think it’s a good idea to be a fireman because of my asthma. Should I listen to them? Why don’t you practice by setting a few rather large fires in your neighborhood? Find an abandoned warehouse and set it ablaze. Or better yet, burn down a coach house. Not only is it fun, but you can practice putting out the fires with the equipment you’ve started collecting. If you manage to save the buildings, then you’re probably cut out to be a fireman. If you go into an asthmatic fit and have to be hospitalized, or get covered in third-degree burns and end up spending the rest of your life being fed by a tube, then maybe your parents were right after all. But you’ll never know until you try. It’s been a year of unemployment for me. I’ve been sending out résumés and showing a lot of moxie, but it doesn’t seem to be getting me anywhere. Please help! I mean seriously, moxie? What are you, a character from a ’20s gangster film? Do you also say things like “using the old noodle” and “never meant to hurt the big palooka”? Referring to your “moxie” will only make people want to throat-punch you, and they sure as hell won’t give you a job because of it. I’m the kind of girl who everyone says would be fun to date, but then no one ever volunteers. I know that I’m capable of dating, since I have in the past. Granted, I’ve dated mostly self-absorbed musicians who loved their guitars more than me. And I dated a hippie once, but he was more of a pet than a significant other. Is there any hope that I can find a guy who will accept me as an eccentric catch? Sounds to me like you’re leaving a big chunk of the puzzle out. I talked to the musician you dated, and the hippie. They both seem to remember you having a lot of emotional problems, as well as Herpes Simplex V. The hippie told me that you rolled him, and the musician caught you making out with his guitar, stroking it and muttering things like, “Hey, no strings attached.” I can’t blame them for being scared away. Seriously, you’re a freak. Write to me when you’re ready to be honest. PS The hippie and the musician are now dating each other, so it wasn’t a total loss. My boss has horrendous garlic breath. It’s like it permeates from his pores and fills the room. Is there anything I can do or say to get through the odor spells with a little more ease? Can you change jobs? I’m serious. I’ve gotten out of cabs for the same reason. Maybe you can slip him some parsley or mint tea or something. That might help. Then again, if it’s really spilling out of his pores, I’m afraid there’s not much you can do. A turtleneck might help. For you, I mean. Just pull it up over your nose whenever he’s in the room. Or maybe a surgical mask. That’d do the trick. Of course, it might look a little odd if you don’t work in a hospital or sand floors. Which brings us back to changing jobs. Have you considered a career as a nurse? I hear it pays pretty well. 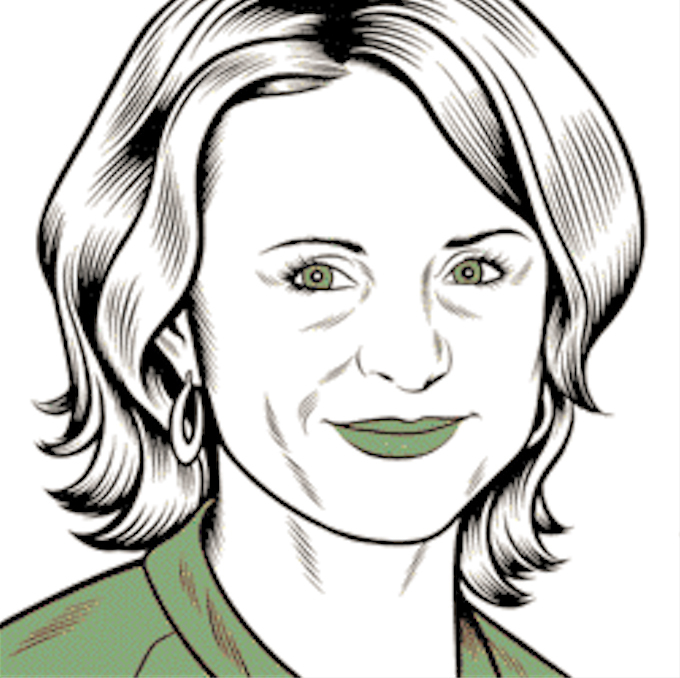 Amy Sedaris is an acclaimed career waitress who occasionally writes and performs when her schedule permits. She lives alone with her rabbit, Dusty, in New York City.